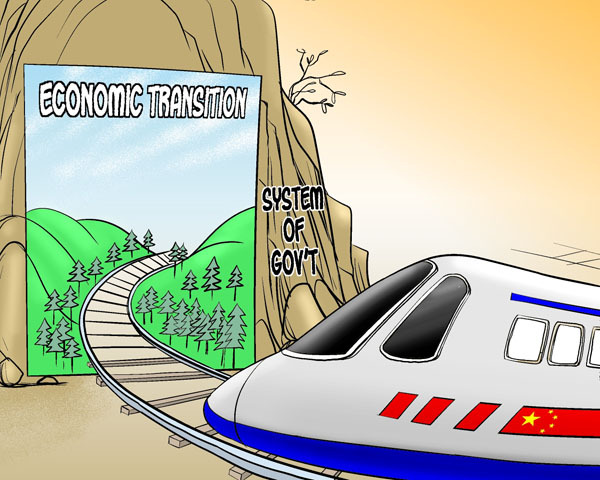 Whether or not China can make some breakthroughs, by transforming government functions to end the "big government" that exists at present, will determine its development prospects. The crux of this is changing the relationship between the government and the market and the relationship between government and society. To begin with, the government must reform its growth-oriented development model and restore a rational relationship between itself and the market. The market, not the government, should play the leading role in the economy. The government has played an important role in boosting the country’s fast economic growth by concentrating resources in investment and construction. Such a model of economic growth relies heavily on large-scale investment, land transfers, heavy chemical industries and the government’s distribution of resources. However, it has meant paying exorbitant environmental costs and resulted in a lack of public services. To solve these problems, the government must change its role to that of a service provider. In the initial development stage of a market economy, the government’s main function is to create a fair market environment for competition. But it is now time for the government to stop regarding fast economic growth as its biggest and most important objective. The government represents public interests. But government interests are now divided among departments, industries and places, lowering the efficiency of the whole system of government and making public interests victims in social life. The government should optimize its administrative power structure by conceding, decentralizing and binding some of its power. That government reform and transformation have not yielded any concrete achievements after years of efforts is because the government’s power structure has not changed. The reform of development commissions of various levels are cases in point. They are responsible for approving big projects and administrating the pricing system. It is very difficult to reform them, as they are in charge of both macrocontrol and specific project approvals. Decision-making power, executive power and supervisory power should provide checks on one another, so that power is not concentrated in one of them. The adjustment of the government power structure can be summed up as the need to concede, decentralize and bind some of its power. To inject vigor into the market and society, the government should concede some of its power to them so the market plays the leading role in allocating resources and so the vibrancy of society is stimulated, creating new models of social governance. The government should also decentralize its power to ensure powers are effectively checked and coordinated. Binding the power of the government refers to increasing transparency to better regulate and supervise government behavior. The government should make a plan for transforming its functions as soon as possible. There must be deadlines for the overdue reforms. The administration approval system reform should be completed in two to three years so as to reform monopoly industries and the pricing system of resources. Social governance reform should be finished in three to five years to concede more power to social organizations and communities and create new models of social governance. In the next two to three years, China should also waste no time in matching government responsibilities at various levels with their tax revenues. Governments should have enough legal tax revenues to pay for the public services they provide, preventing them from seeking revenues from other non-tax sources. China should increase the transparency of its judicial system, government affairs, government financial budgets and civil servant’s property ownership in the next three years. Constructing a mechanism that ensures decision-making power, executive power and supervisory power coordinate smoothly and check one another is the foundation for ministry-level reforms. The forthcoming five to eight years of reform will be very different than before. It will be a tough test of the Chinese government’s political wisdom and courage. The central authority must coordinate the long-term and immediate interests of the country and prioritize the new round of reforms in the most rational order. The author is president of the Hainan-based China Institute for Reform and Development.